As an animal lover, you are probably familiar with the seemingly unlimited capacity some animals have to heal and forgive. Here is the story of "Aimee", a loving rabbit who despite suffering severe neglect, now serves as a rabbit ambassador to the general public, and soothes and comforts the hearts and minds of special needs children. Late October 2002, A160772, a pink-eyed, ten- pound, white female rabbit was impounded at San Francisco Animal Care and Control (SFACC). Pregnant, frightened, dirty, starving and sneezing, her human guardians had moved away and abandoned her in a run down section of San Francisco. Good Samaritan neighbors brought her into SFACC. Her chances of being adopted were not good. She was big, filthy, and needed time, tenderness and a chance to heal. The staff at SFACC contacted us about her, and after being spayed, A160772 came into rescue at our foster and adoption center. We named her Aimee, which means "beloved friend." She would now have the time and medication (donated by Dr. Bing at SFACC) to begin a new life—filled with love and fresh veggies, and free from neglect. Remarkably, Aimee still loved people. She followed us around the house, alongside our dog, Ben. 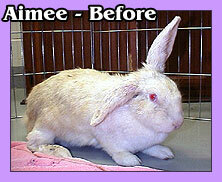 Like most spayed/ neutered rabbits, Aimee was highly intelligent and clean in her housekeeping. She used her litter box and quickly settled into the pampered life of a house rabbit. 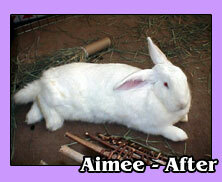 Aimee made it clear she preferred people to other rabbits and didn't want a rabbit companion. She was such a big, happy girl and had so much love to share, we decided she was the perfect rabbit spokesbunny; after all, Aimee had almost everything "wrong" with her. She is a New Zealand White rabbit—very big, basic white rabbit, with large "red-eyes." This breed of rabbit, notable for its large size and docile nature, is typically bred for meat production and used in laboratory testing of cosmetics and household cleaners. Their size and temperament makes them an ideal family companion, especially for homes with children, yet they are almost always passed over in favor of "cuter" lop-eared or dwarf rabbits. Today, Aimee is a regular visitor to classrooms and at events for special needs children. Through her patient and gentle presence, children experience first hand the beauty, grace and vulnerability of another creature. They learn about making and keeping commitments to animals, as well as responsible and compassionate animal care. As they tenderly stroke her soft, long ears and look into her expressive pink and lavender eyes, they also see that love is still possible after abuse or neglect, and that it's OK to be different. So, Aimee's story isn't really over. It's just beginning. With each child she meets and each life she touches, Aimee proves that love can heal and transform the wounds of abuse and neglect. For more information on rabbits and rabbit care, be sure to visit the House Rabbit Society national website, and the SaveABunny website.